Disclaimer: This post presents an overview of what I know in 500 words or less. I do not pretend to be an expert! I mostly use present-day place names. Corrections welcomed. 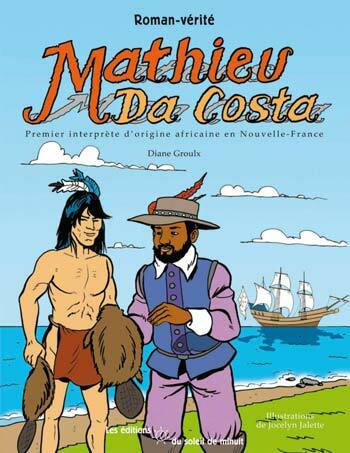 Mathieu Da Costa was the first black person known to set foot in what is now Canada, probably sometime before 1603 with Portuguese explorers. He was from the Benin Empire (Nigeria) and could speak Edo, Portuguese, Dutch, English, French, pidgin Basque and Eastern Algonquin. He later served as an interpreter for Champlain and other French explorers. 1. 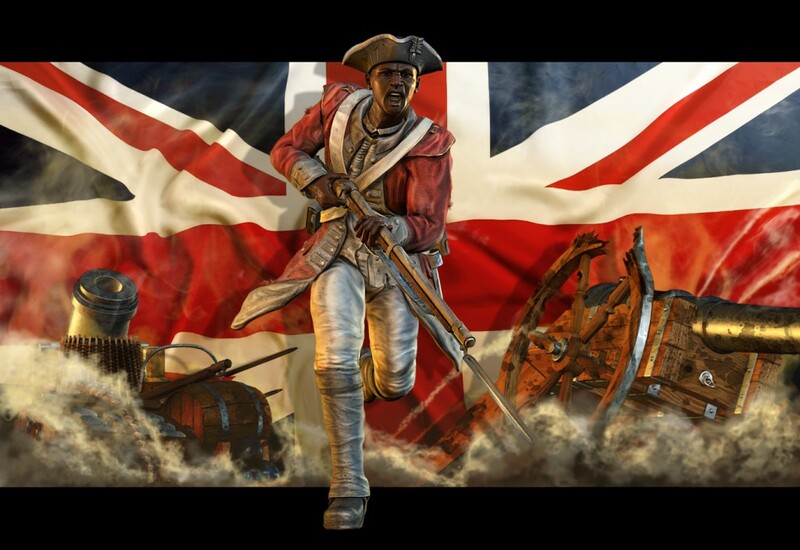 Black Loyalists (1780s, 1810s): The British promised “Liberty to Slaves” and land too for those who joined their ranks in the American Revolution and the War of 1812. 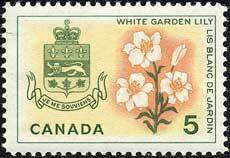 Many were settled in Canada, particularly in Nova Scotia and Ontario. Those that settled in Nova Scotia after the American Revolution did not get their promised land. Half were later resettled in Sierra Leone in West Africa. 2. 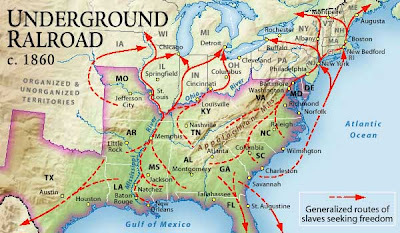 Underground Railroad (mostly 1840s-1850s) was a secret network of safe houses that stretched from the American slave South all the way to Canada. American slaves sang about the freedom train and talked about crossing the Jordan River. Whites thought they were talking about going to heaven, not Canada! The “Jordan River” was the Detroit River at the Canadian border. The great thing about Canada was that it had outlawed slavery in 1833. Even free blacks were safer there than in America, especially after Americans passed the Fugitive Slave Act of 1850. Most escaped slaves settled in Ontario between Detroit and Toronto. Contrary to stereotype, they seemed intelligent and placed a high value on education. Some White Canadians were racist, leading to segregated schools, but overall they were less racist than White Americans, even those in the North. Some blacks later returned to America, some mixed with White Canadians and some are still there today as Black Canadians. 3. The Lily White Canada Policy (c. 1896-1962) was never called that, but from letters between government officials we know there was an unwritten rule to keep blacks out by hook or crook. From 1896 to 1907 Canada let in 1.3 million Europeans and Americans, but fewer than 900 blacks! Not a wave but a trickle. 4. Caribbean immigration (1960s to present). Two-thirds of Black Canadians have their roots in the Caribbean. Gloria Reuben and Malcolm Gladwell, for example, have Jamaican mothers. Singers Deborah Cox and Melanie Fiona have Guyanese parents. Michaelle Jean, the Governor General from 2005 to 2010, was born in Haiti. Jamaicans mainly settle in English-speaking Ontario, especially in metropolitan Toronto. Haitians mainly settle in French-speaking Quebec. The Black Canadian unemployment rate is high compared to whites, even for those with university degrees, but the difference is not as bad as it is in America. Nova Scotia’s anti-black racism is so bad that it has been called the Mississippi of the North. They still had racially segregated schools as late as the 1980s. But that still puts it ahead of America, where schools are resegregating. Thanks to Herneith for her help with this post. All mistakes are mine! Sources: Black History Canada, Learn Quebec: How they kept Canada almost lily white, The Root (2011), Wikipedia (2014). Deborah Cox: Did You Ever Love Me? 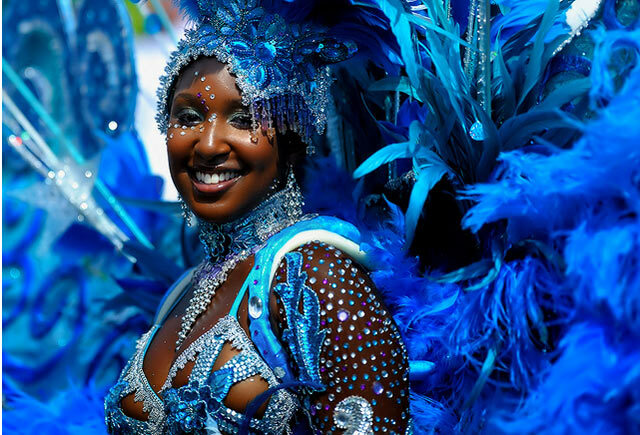 Been to Toronto’s Caribana a couple times and it was great! It’s like big, bright splash of home, big up to all my beautiful Caribbean peoples! //It’s time for me to attack Canada!! Then when I FINALLY saw another Black person walking near Stanley Park, I crossed the street just to make sure he wasn’t a MIRAGE! And so I kept looking at him and he ^%$^%# wouldn’t look back!! So I nodded my head, but he wouldn’t look at me!! and I even said “Hey” as we passed Andhfj he Pretended not to even notice that I was talking to him!!! *I also had a small Asian lady look at me as if I was Bigfoot. Next time go to Toronto, there is a black person every where! Good post. I wonder how many whites in Canada have Native, Black, or Asian roots. or vise verse .Just wondering because I wasn’t sure if segregation is or was as common in Canada. I’m always suspicious of racial statistics because maybe people lie on census questions. I wonder how many whites in Canada have Native, Black, or Asian roots. Quite a few married First Nations people during the 1800s’ , especially the escaped slaves and the veterans from the War of 1812. Many also owned farms as they were given land allotments. Lena Barth, stay where you’re at. What makes you think that Mongolians would want any bloodthirsty Sub-polar Europeans immigrating there? @Lena Barth; I suggest you move to Siberia, or the lower region of Hades would be more suitable. Fascinating. Thank you Herneith and Abagond for sharing this aspect of our diaspora. I know very little about Black Canada, although I yearn to learn so much more. My grandmother was born in Winnepeg, and my godmother was from Vancouver, so I do have a vested interest in the subject. It’s interesting that for all of Canada’s supposed “neutrality” and egalitarianism where race is concerned, Canadian society is still skewed against blacks, who still seem to receive the short end of the stick there. @ Lena Barth: You might want to consider Antartica, lots of whiteness there. Never been to Canada. An older relative of mine visited there years ago, he loved it and wanted to re-vist but passed on before he got the chance. I’ve been wanting to try the dish ‘poutine’ that is so popular in Canada. Though I wanted to prepare it myself, one ingredient of the dish, fresh cheddar cheese curds, does not seem to be available where I am. @King, Vancouver is less than 1% black. The blackest area in Canada are Toronto, Montreal and Halifax. @ Abagond, I see you placed EAST Asians and SOUTH Asians in one big group. Another thing is that nearly 2/3s of all Caribbean Canadians are Jamaican. A Book on slavery in Canada is The Hanging of Angelique. To me, the most alarming part of the post is the low numbers of native people listed for both the US and Canada. I’m sure there are factors I neither know or understand that explain it, but W…T…F? @buddhuu, the factor you are looking for is called a foreign invasive species. I’ve been wanting to try the dish ‘poutine’ that is so popular in Canada. Poutine is a heart attack waiting to happen if ingested regularly. I partake of that dish every couple of months. You can use just cheese curds also. I usually have it with a ton of gravy! If it wasn’t snowing here I would go out and get some. It is interesting especially when they look down on Americans for their racism. They think they are ‘morally’ superior to the Yanks. They are the same but more polite about it, hypocrite, much more insidious. There is a lawsuit against the Toronto Police for disproportionately ‘carding’ young black men, for example. There is a lot of systemic and institutional racism here. I saw the same thing in Europe. They love to pat themselves on the back, thinking they’re better for not being racist like Americans, but I found they were just the same, if not, much worse. Behind their phony smiles and polite greetings, they still see you as a guest in “their” country. And by that, I mean they could not believe nonwhites belong to America. Damn. That had not escaped my notice. Great post, me and my Wisdom who is Jamaican were just having this discussion about the Black migration to Canada. I contended that not all Black people in Canada had come from the Caribbean as she believed. I pointed out many Black people came to Canada escaping U.S. racial oppression and the resettlement from Revolutionary war and War of 1812. And to a small degree during the 60’s and 70’s to avoid going to Viet Nam to fight war. Concerning the percentages of people’s that make up in the States. We are told that there are 16% Latino and 12% Blacks. However, 4% of Latinos polled identified as Black/Afro first then Latino. Wouldn’t this lessen the Latino percentage by 4% and increase the Black population by 4%? Wouldn’t it then be more accurate that the Latino percentage in the States be 12% and Black be 16%? Your thoughts? @ Herneith & Abagond; Thanks for the insight and enlightenment about the history of black people in Canada, I just finished reading about Angelique of Montreal, it was quite tragic, it seems she was a scapegoat. This gets rid of Latino, multiracial and Other and puts them under one “race” or another. It takes the census undercount into account. I should probably recalculate everything and make a post of it for future reference. I lumped together all Asian Canadians so I could compare them directly to Asian Americans. The same with Native Canadians. From what I know, half of Caribbean Canadians are Jamaican. @ Mel: Just read about the hanging of Angelique. Tragic. Did my post not get posted? @amenta @agabond Growing up in the Greater Toronto Area I too believed that black Canadians were all recent Carribean immigrants. Canada (like the USA) likes to erase much of it’s black history from the school books. For example, I didn’t know anything about the black settlements in Nova Scotia until I read The Book of Negroes (aka Someone Knows My Name) as an adult. I don’t know where you get that idea. Canada officially practised slavery since 1628, and the black slave population increased from 1783-1833. But, good point about the US Census figures…but there’s plenty of evidence that blacks are severely undercounted, not just b/c some classify themselves as Latino but b/c some classify themselves as “other race” “2 or more races” (even if they’re not technically “mixed”), the census doesn’t count homeless people outside shelters, and usually misses a lot of people who live in remote areas like Mississippi’s Delta, as admitted by the Census. And there are many who just don’t respond. And of course, the white population is inflated due to mestizos and Arabs being classified as white even though in reality few really see them as white. Census Bureau admits to overcounting whites and undercounting blacks even more than non-black latinos. I think Canada underestimates its black population too. Some of the earliest known Blacks to what is now Nova Scotia were ex-slaves of Spaniards, the first European nation to colonize Jamaica. Spanish settlement did not commence until the early 1500s. (Columbus landed on it shores in1494). In 1655 the island was captured by the British, but the before the Spaniards fled, they freed their slaves (the Maroons). For the next hundred or so years, they did wreaked havoc on British sugar plantations – burning them, freeing slaves, and, since they had been on the island for a hundred and more years at that time, they knew the lay of the land, especially Jamaica’s mountainous interiors. After incessant raids on sugar plantation, the British signed a treaty with them. As most of us know, European treaties with peoples of colour meant absolutely nothing to colonial powers. The ex-slaves, (Maroons) who thought an agreement had been reached, and the Brits, now knowing where in interior of Jamaica they settled, rounded up a large number which was shipped off to the rocky shores of what we call Nova Scotia today. This was in the latter part or the 1700s. Some Afro-Canadians are descendants of the Maroons. Ironically, the signature to Maroon/British treaty, King George 111, was the same British Monarch who lost the thirteen American colonies. The Brits, it seems, had a way of removing undesirables and those they deemed non-conformists – not unlike the expulsion of the Acadians/L’Acadiens from parts of what is now Nova Scotia and New Brunswick to Louisiana. Their descendants now refer to themselves as Cajun. Of course this the US’s One Drop Rule you are applying onto another nation, and for the purpose of “future reference”, but the language you use is pretty LOADED, wouldn’t you say? Why can’t someone be black AND Latino? It’s as if you’re saying people who are Other, or mutliracial or whatever they wish to call themselves on a census or in life wouldn’t complicate and obfuscate things by reflecting who their families actually are. Abagond, a really informative post about Canada. I have heard conflicting info about this, on the one hand no slavery, on the other slavery. And also that most slaves were the indigenous peoples of Canada and not Africans. I am not sure what to believe. They did have slavery, but nothing on the scale of the tobacco, cotton or sugar growing regions to the south where there were millions of slaves. Some of them almost certainly were indigenous, maybe even most, but I do not know the breakdown. It could also be that most masters were indigenous. Most masters were indigenous? Really? I had no idea, and was under the impression that such a thing was isolated. I know relatively little about Canada, but I believe the stumbling block in my grasp of the subject of slavery in that nation — whether black or indigenous slavery– boils down to when Canada actually became recognized as the dominion of Canada. “Canada officially practised slavery since 1628, and the black slave population increased from 1783-1833”, this was a time when the British Empire called this part of the Americas “British North America”. It hadn’t become Canada yet…so slavery didn’t technically exist because Canada didn’t exist. A sneaky bit of history teaching. Why am I not surprised! On 1st July 1867, the British British parliament passed the “North America Act”, and the Dominion of Canada was formed. I will have to do a post on the “true” numbers. Any short answer I can whip off as a comment is not going to help. In my disclaimer at the top of the post I said, “I mostly use present-day place names.” So “Canada” means the part of the world now known as Canada. Yes, Abagond, that’s true, you did. But that’s not what I meant at all! I was not questioning anything you said regarding THAT point. Rather, I was seeking clarity because I simply didn’t understand how what I had been taught about “no slavery in Canada”. This didn’t tally with the slavery that clearly went on simply because of the technicality of a name which was never really explained when I was trying to learn about these things. That’s the trouble with being educated in a post-colonial state. Last year, an Irish acqaintance mentioned Hogan’s Alley, a series of stories about Irish-American slum life. I looked up the name on the internet, but obviously looked in the the wrong place (Youtube), because what I found instead was another Hogan’s Alley, in Vancouver, which is said to be the place of that country’s first black community Though flourishing, it was bulldozed. Jimi Hendrix used to live there. The black experience in Canada is really interesting, because the country counts like 35+ million people in the second largest country size wise after Russia. Canada has practiced a severe segregation policy (provinces such Alberta where i live, have relaxed their immigration choices policy in the early 80s, and the large portion of black immigrants were nannies from Jamaica), but we are supposed to be polite and multicultural, so we pass on the mistakes of the past when it concerns, european descent canadian actions. Historically, few books or artefacts have been left by Black Canadians, I know that in Ontario, they try to collect them and take Black history month seriously. But in the West, where I live, people tend to mimic the Texan cowboy culture and/or the trailer/redneck mentality, the large portion of black people are first generation african/carribean, so there is the “FOB” (fresh off the boat) stigma, they are not considered “canadian”. Here the white brotherhood is legal in some ways, neo nazi activism in Alberta and BC is well known, gangs such as the hell angels rule overtly, and lately an increase in racism or White pride among the 20-40 years old people have been noticed. You still can find clubs refusing black people/asians/east indians for no reason, and the police is trying to be fair, but don’t do nothing on the subject, as it’s a well known fact that Blacks are 3% of the whole population, but 12% are in prison confinement all over Canada. Ontario is blatantly discriminating against Blacks/Africans. The other provinces do it but silently, subtly. You still can find a job easily though, but the more “canadian” you are the better it is to fit in and progress. A criminal sentence for a Black person will be heavier for the same crime, if compared to a white person (male or female). (20% of the canadians have a criminal record). People here have a hard time accepting that one can be a Black and Canadian for more than two-three generations. Because the country is known as “the great white north” not just for the snow lol. As an example, Alberta until the early 80s, was choosing its own immigrants and the criteria was european (as much as possible), from cold places so one can find lots of germans, swedish, ukrainians, finnish, danish and the usual irish, english in western canada. the lack of interest from Europeans drove them to open the gates to various nationalities, especially from the commonwealth. So the english will stay on top of the pyramid and people won’t complain as they are already trained/groomed in the commonwealth/colonial british empire. The Canadian case is really different, compared to the U.S as the british crown is still ruling, so the same hierarchies subsist and at the same time, Canadians mimic the Dixieland mentality and culture with a canuck twist to it. Canada is a great place to live, if you know what you want and are driven, but, for the largest portion of Black africans freshly landed, it is a struggle, I see it as I try to hire them, language and cultural make the experience tough, and many mimic the “Ghetto” behavior, selling drugs to live and show off. It’s fascinating to see people from all ethnicities fascinated by Black rap/hip hop stars but still having a hard time building bridges with their own black people. On a positive note, McCoy from “the real Mccoy” sentence was a black Canadian, intelligent and revered in his time. Canadians are certainly racist, but by far most of their hatred and contempt is directed at first nations and metis people, with south asians as the next closest. Blacks definitely get it crappy back east and in little texas(alberta), but out west blacks are more seen as a novelty than as a threat because there are so few of them and many western canadians(especially from smaller towns and cities) have rarely even seen blacks before. Very much enjoy a good history lesson and this was a good one! Thanks Agabond!